By way of introduction, I want to say to you that this article has been more painful to me to write than all the other articles in the HMC put together. God has wrung it from my heart, because for me - single at 32 - it is an extremely personal subject. What is written here is not so much an admonition for you, though it is that, as an outpouring of my desire for my own life in this matter. And, as I deal with this myself, my heart is moved for so many sisters and brothers that I know are laboring under the selfsame burden - for the parents who stand helplessly by trying to accept the fact that it may be God's will for their beloved child to remain single- for the friends and family who cannot understand why the Lord does not allow their loved one to marry. If what is written here seems too long, too stark, or too emotional; please remember these things and "bear with me" in my infirmities. This is not a pathetic plea for pity, but rather a heartfelt, yea, even urgent cry for contentment - peace - joy - rest. 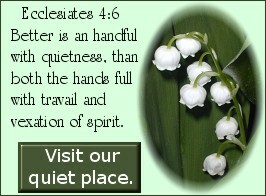 1Timothy 6:6 But godliness with contentment is great gain. It is an effort in a small measure to fulfill 2 Corinthians 1:3-6 in some way. 2Corinthians 1:3 Blessed be God, even the Father of our Lord Jesus Christ, the Father of mercies, and the God of all comfort; 4 Who comforteth us in all our tribulation, that we may be able to comfort them which are in any trouble, by the comfort wherewith we ourselves are comforted of God. 5 For as the sufferings of Christ abound in us, so our consolation also aboundeth by Christ. 6 And whether we be afflicted, it is for your consolation and salvation, which is effectual in the enduring of the same sufferings which we also suffer: or whether we be comforted, it is for your consolation and salvation. There are a few that are born single as it were, because of some physical or mental condition that prevents them from marrying. For a very few it is a purpose achieved. It is hard to say if there are any these days that chose to be single before they experienced a desire to marry at some point. Then there are those who quite literally are forced to live as single to be in obedience to the word of God. These are those who have been divorced; Luke 16:18, Matthew 5:31-32, Matthew 19:3-9. Their situation is different since they may not marry again unless their former spouse dies, Romans 7:2-3. For the large majority of us, it is something that we would not have chosen for ourselves. It is something that we hoped we would not have to face. For the younger among us - something you still hope will not happen to you. It is a temptation at times for the older among us to chuckle at or be impatient with the younger ones for beginning to worry about being single at such an early age. In some cases it is probably quite frivolous for the young ones to worry and for the wrong reasons. But, it certainly is hard for a godly young person to miss the fact that there are older brothers and sisters in Christ who are still single, and not by their own choice. Times are hard. It is the Laodicean era. The answer is not to haste with our feet or fret against the Lord. Proverbs 19:2 Also, that the soul be without knowledge, it is not good; and he that hasteth with his feet sinneth. 3 The foolishness of man perverteth his way: and his heart fretteth against the LORD. If we believe Romans 8:28, as we say that we do, then the answer is that God will work singleness together for our good if we love Him. God can glorify Himself through this. 1Peter 1:7 That the trial of your faith, being much more precious than of gold that perisheth, though it be tried with fire, might be found unto praise and honour and glory at the appearing of Jesus Christ: If we yield to Him, we may truly be single to the glory of God. 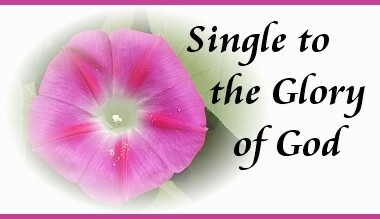 Single to the glory of God. What a novel concept this is to some! It would seem an utter absurdity to others. In churches where match making is almost a sport, and to preachers who seem to think it their personal duty to marry off every single person who crosses their path it would border on blasphemy. Yet for us it is not only good to believe it can be so, but needful. We must believe and know that this can be done not for others, but for ourselves. What if the Lord should will us to marry in a year, in 5 years, in 10 years? Surely that would be a blessing. So, shouldn't it be a blessing that today He has willed us to be single? 1Corinthians 7:29 But this I say, brethren, the time is short: it remaineth, that both they that have wives be as though they had none; We see here the married man admonished to serve the Lord as though he were not married because the time is short. How much more should we that are single serve the Lord without being preoccupied with thoughts of marriage for this same reason? Indeed, vs. 34-35 tell us so. 1Corinthians 7:34 There is difference also between a wife and a virgin. The unmarried woman careth for the things of the Lord, that she may be holy both in body and in spirit: but she that is married careth for the things of the world, how she may please her husband. 35 And this I speak for your own profit; not that I may cast a snare upon you, but for that which is comely, and that ye may attend upon the Lord without distraction. If God wills us to be single for part or all of our adult lives it is so that we can care for the things of the Lord and serve Him without distraction. It is not meant to be a snare to us! It is for our profit. How often we seek satisfaction from the wrong sources. We may seek it through our good works, though we know that they do not save us or keep us saved. We may seek it through being virtuous women, through faithfully doing what we know or think to be our duty. And, there is some measure of satisfaction in these things. As single, however, we are tempted to imagine that being married grants some special or extra measure of satisfaction. But, the voice of God speaks clearly - Proverbs 19:23 The fear of the LORD tendeth to life: and he that hath it shall abide satisfied; he shall not be visited with evil. From the beginning of the Bible to the end the fear of the Lord is necessary. Only those who fear God will hearken to His word and way. Proverbs 14:26 In the fear of the LORD is strong confidence: and his children shall have a place of refuge. In fearing the Lord, we can abide satisfied (not a temporary thing) and have strong confidence that He knows what He is doing with our lives, and why. We may have strong confidence and satisfaction in knowing that He will glorify Himself through our singleness. Philippians 4:11 Not that I speak in respect of want: for I have learned, in whatsoever state I am, therewith to be content. 12 I know both how to be abased, and I know how to abound: every where and in all things I am instructed both to be full and to be hungry, both to abound and to suffer need. To be content is probably one of the hardest lessons to learn, (especially in regard to remaining single). The fact that it is learned though, tells us that it is something we must "take lessons in" in order to gain it. It is not something we can achieve instantly. It is not a gift of the Spirit, nor is it automatically granted at salvation. It is an education - an education of great gain. 1Timothy 6:6 But godliness with contentment is great gain. For most of us, it is something that we will probably go on learning much of our lives, but it is important to note that it can be achieved. Paul speaks in the past tense - "have learned" - not as an ongoing thing. Take heart, dear sisters, contentment can be attained! Its' lessons are not always going to be pleasant, in fact are often painful, but they can be learned. We must be instructed both to be full and hungry, to abound and suffer need. But, oh, what a wonderful Instructor we have! What a kind and compassionate Friend we have to teach us! Hebrews 4:15 For we have not an high priest which cannot be touched with the feeling of our infirmities; but was in all points tempted like as we are, yet without sin. 16 Let us therefore come boldly unto the throne of grace, that we may obtain mercy, and find grace to help in time of need. Hebrews 13:5 Let your conversation be without covetousness; and be content with such things as ye have: for he hath said, I will never leave thee, nor forsake thee. Such things as we have at this time for us is to be single - to care for the things of the Lord. And, the reason to be content is because we have the Lord's promise that He will never leave nor forsake us! With such a promise how is it that we are so often tempted to feel forsaken? So often, we seem to think that we have somehow been deprived of that blessing called marriage, when the Lord wants us to be content with "only" Him. Is He not enough? Yet there are 2 sides to this contentment to be single. For some there has been or is the issue of being content to marry someday if the Lord so leads. For some, having been single for many years or perhaps enjoying it so well, it can actually be a battle to take the responsibility of marriage cheerfully. There are considerably fewer cares in life for most singles (both men and women). For some of us, perhaps many, we cannot help but think at times that being single really is a lot less work and pain. But, if the object is to be content in whatsoever state we are in - and it is - then we must be willing to be content in the state of marriage should God so will that for us. Romans 7:18 For I know that in me (that is, in my flesh,) dwelleth no good thing: for to will is present with me; but how to perform that which is good I find not. 19 For the good that I would I do not: but the evil which I would not, that I do. Romans 7:23 But I see another law in my members, warring against the law of my mind, and bringing me into captivity to the law of sin which is in my members. 24 O wretched man that I am! who shall deliver me from the body of this death? 25 I thank God through Jesus Christ our Lord. So then with the mind I myself serve the law of God; but with the flesh the law of sin. How often we can say of ourselves ...the spirit indeed is willing, but the flesh is weak. Matthew 26:41 As we see with Paul, only Jesus Christ can deliver us from the body of this death. It is only through Him that we can triumph (2 Cor. 2:4) and abide satisfied. Galatians 5:16 This I say then, Walk in the Spirit, and ye shall not fulfil the lust of the flesh. 17 For the flesh lusteth against the Spirit, and the Spirit against the flesh: and these are contrary the one to the other: so that ye cannot do the things that ye would. 18 But if ye be led of the Spirit, ye are not under the law. "...To die to dear desire, self-will resign..."
This phrase from the song "So Send I You" comes to my mind often. The dearer the desire, the harder it is to die to it. How very dear the desire to marry is for most of us (including our brothers in Christ)! How we are tempted at times to set goals, objectives, and dreams before us and say in our hearts, "That is the way it has to be." We ought rather to set the Lord always before us, and trust Him to attend to our needs. Psalm 16:8 I have set the LORD always before me: because he is at my right hand, I shall not be moved. 9 Therefore my heart is glad, and my glory rejoiceth: my flesh also shall rest in hope. How very hard it is for the flesh to say ...thy will be done. Matt. 26:42 Our flesh can only rest in hope when the Lord is before us and His will is more important to us than our own. The desire to marry and have children in itself in not wrong. It is how we deal with that desire that is either right or wrong. If it takes preeminence over Jesus Christ it is wrong. Colossians 1:18 And he is the head of the body, the church: who is the beginning, the firstborn from the dead; that in all things he might have the preeminence. We must cast ...down imaginations, and every high thing that exalteth itself against the knowledge of God, and bringing into captivity every thought to the obedience of Christ; 2 Corinthians 10:5 It is against the knowledge of God to imagine how we think things have to or should work out. It is against the knowledge of God not to trust Him with our lives, both present and future. He knows us infinitely better than we know ourselves (yet still loves us), and He knows what is good for us, whether single or married. Dear ones, is He not worthy to have the preeminence in our lives? Is He not worthy to have our love, our trust, our hopes, our dreams? How sad that we neglect our faithful Lord that bought us, Who is worthy of our love, trust and so much more! Revelation 4:11 Thou art worthy, O Lord, to receive glory and honour and power: for thou hast created all things, and for thy pleasure they are and were created. What pleasure did we give the Lord today? Or were we too busy planning and dreaming about things that are not His will for us right now? The knowledge of Him tells us that He knows all these things about us, and what we have need of. Surely if He knows the number of hairs on our heads, He knows every need we have (Matt. 10:30); and He is worthy for us to lay our desires and self-will on the altar for Him. A living sacrifice - to be crucified unto the world and world unto me (Gal. 6:14) that I might live the life of Christ (Gal. 2:20) - this is what it means "to die to dear desire" - to resign self-will. Why? For what purpose? Philippians 3:10 That I may know him, and the power of his resurrection, and the fellowship of his sufferings, being made conformable unto his death; 11 If by any means I might attain unto the resurrection of the dead. 12 Not as though I had already attained, either were already perfect: but I follow after, if that I may apprehend that for which also I am apprehended of Christ Jesus. 13 Brethren, I count not myself to have apprehended: but this one thing I do, forgetting those things which are behind, and reaching forth unto those things which are before, 14 I press toward the mark for the prize of the high calling of God in Christ Jesus. Society or culture may pressure us to marry "at least once." Our family and friends may pressure us to distraction to marry. (For those who are divorced this is even harder to deal with.) But, we cannot blame them for the desire to marry, for this was ordained of God in the garden of Eden. First, the woman was created to be an help meet for the man's needs. This was because it is not good for man to be alone and he needed someone to cleave to (Gen. 2:18 & 24). So we see our brothers in Christ have this desire also. Secondly, Adam and Eve were commanded to be fruitful and multiply, so the desire to have and raise children is a natural desire (Gen. 1:28). Thirdly, after the fall, the woman's desire is to her husband, and he is to rule over her. So, for all of us these desires work both ways. Those of us who were raised by godly parents (and some of us who were not) were raised with the objective of becoming virtuous (or married) women. The virtuous woman of Proverbs 31 is a married woman - a woman with children. (Our brothers in Christ were raised to be godly men and/or able leaders and providers of a home - a home with a wife and children.) This training is right a good; but as Christians, it is not our chief end. There are natural desires relating to marriage that are older than sin itself. To name some - the desire for companionship, the sexual desire, the desire for a singular love (see Song of Solomon), the desire for children and a family of our own. These were ordained by God before man fell. No matter how we may torment ourselves with the frustration and sorrow of not having these desires fulfilled, it is not the desires that are wrong, but rather our attitudes and feelings about them. 2Corinthians 4:6 For God, who commanded the light to shine out of darkness, hath shined in our hearts, to give the light of the knowledge of the glory of God in the face of Jesus Christ. 7 But we have this treasure in earthen vessels, that the excellency of the power may be of God, and not of us. 8 ï¿½ We are troubled on every side, yet not distressed; we are perplexed, but not in despair; 9 Persecuted, but not forsaken; cast down, but not destroyed; 10 Always bearing about in the body the dying of the Lord Jesus, that the life also of Jesus might be made manifest in our body. 11 For we which live are alway delivered unto death for Jesus' sake, that the life also of Jesus might be made manifest in our mortal flesh. As earthen vessels it hurts to bear such a treasure as this. Always we must be dying to self so that Jesus' life might be made manifest in our body. Our flesh is mortal. It is full of death. Bearing the death and life of Jesus Christ is painful to this weak flesh. But, we are not distressed. We are not in despair. We are not forsaken. We are not destroyed. Why? Because it is Jesus' life that is being manifest in us, and He cannot be any of these things! What a comforting thought! When we are tempted to feel any of these things it is because of our earthen, mortal flesh. We must immediately flee to our refuge and lay hold of our strong confidence. A few of you are familiar with the terrible valley the Lord brought me through in 2000. He took from me my physical strength and my emotional strength, forcing me to cast myself upon Him in a way I had never done before. There were hours when I had to entreat Him often or constantly to carry me, for I had no strength to go on. It was a valley of the shadow of death, for though death itself was not near, the shadows of it were deep around my soul. During that time the Lord completely removed from me my desire to ever marry. With no physical strength and being shattered emotionally, I had no desire for marriage. I saw that I could not be a good wife to anyone, for my weakness was too great. I came to the point, in fact, where I refused to consider marrying even if it was God's will for me. So, I went from desiring marriage too greatly and thinking I could be a good wife, to rejecting it even if it were God's choice for me and not believing that He could give me the strength to be a wife. Ah, but ...he said unto me, My grace is sufficient for thee: for my strength is made perfect in weakness. Most gladly therefore will I rather glory in my infirmities, that the power of Christ may rest upon me. 2Corithians 12:9 This is a lesson my Lord wants me to learn. Over the last number of months, as the Lord has increased my strength, I have found that the old desire to marry returning. It has sprung up again, sometimes with a frightening intensity. Yet at times it is still the struggle of refusing to marry that will overtake me. Surely this flesh is weak! Romans 11:33 O the depth of the riches both of the wisdom and knowledge of God! how unsearchable are his judgments, and his ways past finding out! Truly His ways are past finding out, and His wisdom and knowledge are deep riches. How often we fail to see ourselves as we ought to until, in His great love for us, He forces us to only look at Him - at the face of His dear Son. Through chastening He will claim our undivided attention. Through His ways, which sometimes seem so strange to our human minds, He will press us "into knowing no helper but God." Hebrews 12:11 Now no chastening for the present seemeth to be joyous, but grievous: nevertheless afterward it yieldeth the peaceable fruit of righteousness unto them which are exercised thereby. The Lord knows and understands that there is no joy for us in chastening. From this verse we see that He does not expect us to enjoy it. But, His purpose is that we might yield the peaceable fruit of righteousness. A tree must be pruned so that it will bear good fruit. A tree must be exercised by strong winds and storms, or it will break under the least stress. Often, the greater the conflict and struggle that He puts us through, the more we desire that peaceable fruit of righteousness. Thus, we are "pressed into loving the staff and the rod." Psalm 42:1 As the hart panteth after the water brooks, so panteth my soul after thee, O God. 2 My soul thirsteth for God, for the living God: when shall I come and appear before God? How can we conquer in these conflicts? How can we desire right things, and those according to His will? Proverbs 16:3 Commit thy works unto the LORD, and thy thoughts shall be established. Having our thoughts established in Him and His will, rather than on ourselves and our will, is achieved by committing our works to Him. Psalm 37:4 Delight thyself also in the LORD; and he shall give thee the desires of thine heart. 5 Commit thy way unto the LORD; trust also in him; and he shall bring it to pass. Assuming that God will give us whatever we desire if we delight in Him is not the point here. If we truly delight in the Lord, He will cause us to desire things that are according to His will. This will be delightful to us! When we commit and trust, He will bring those desires to pass. If He wants us to glorify Him as married, He will make a way to His will. If He desires us to glorify Him as single, then He will make a way to peace and contentment for us and give us something to care for of His. Psalm 73:25 Whom have I in heaven but thee? and there is none upon earth that I desire beside thee. 26 My flesh and my heart faileth: but God is the strength of my heart, and my portion for ever. In being single to the glory of God, we must concentrate our desires upon the Lord - upon how we might please Him, instead of a husband; and in caring for His things. He will then cause us to desire things that glorify Him. Luke 12:34 For where your treasure is, there will your heart be also. Romans 8:35 Who shall separate us from the love of Christ? shall tribulation, or distress, or persecution, or famine, or nakedness, or peril, or sword? 36 As it is written, For thy sake we are killed all the day long; we are accounted as sheep for the slaughter. 37 Nay, in all these things we are more than conquerors through him that loved us. For those that are single and wish to marry it is often hard to seek not our own. It is a temptation to be constantly looking and hoping for a worthy husband (for our brothers in Christ - a virtuous wife). It can become a preoccupation - a very unhealthy one. When the Lord does not open doors and arrange things when and how we think they should be, we easily fall into discontent. Jealousy and envy then become perilous foes, especially when we see our friends and/or siblings entering into this blessing of marriage from which we are "deprived." 1Peter 2:1 Wherefore laying aside all malice, and all guile, and hypocrisies, and envies, and all evil speakings, 2 As newborn babes, desire the sincere milk of the word, that ye may grow thereby: The common manner of the flesh is For all seek their own, not the things which are Jesus Christ's. Philippians 2:21 Our calling as Christians, however, is not so. 1Corinthians 10:24 Let no man seek his own, but every man another's wealth. When we seek our own it is hard to take thought for the things of others as we are told to do. Surely it is a great sacrifice to put other's interests above ours in this area. It is not natural to our human nature. It is only by the mind of Christ, and His power working in us (Eph. 3:20) that we can do so. 1Corinthains 2:16 For who hath known the mind of the Lord, that he may instruct him? But we have the mind of Christ. Colossians 3:1 If ye then be risen with Christ, seek those things which are above, where Christ sitteth on the right hand of God. 2 Set your affection on things above, not on things on the earth. The answer is to seek those things which are above. The things above we find in, Matthew 6:33 But seek ye first the kingdom of God, and his righteousness; and all these things shall be added unto you. When we seek these things, if God wants us married He will add that according to His will. He will supply all that we need that we might obey His word and bring Him glory whether single or married. 1Peter 5:8 Be sober, be vigilant; because your adversary the devil, as a roaring lion, walketh about, seeking whom he may devour: 9 Whom resist stedfast in the faith, knowing that the same afflictions are accomplished in your brethren that are in the world. Our adversary the devil is seeking to devour us. One way he tries to get to us is to tempt us to seek the wrong things. When we do not ...press toward the mark for the prize of the high calling of God in Christ Jesus (Philippians 3:14), but rather seek things after the flesh, he may well give us something that we will heartily wish we had not sought after! So, in seeking not our own, we must be yielded to the will of God whether it is to rejoice in others' marriages (even when we see none in our own future), or to be willing to marry when singleness seems easier or more desirable. 2Samuel 22:33 God is my strength and power: and he maketh my way perfect. Hebrews 12:2 Looking unto Jesus the author and finisher of our faith; who for the joy that was set before him endured the cross, despising the shame, and is set down at the right hand of the throne of God. 3 For consider him that endured such contradiction of sinners against himself, lest ye be wearied and faint in your minds. When we consider His great sacrifice for us, ours doesn't seem unreasonable, nor as large as we sometimes think it is. Doubts are like vultures. They don't come one at a time, but by fours and fives, sometimes by dozens. If we don't chase the first ones away, many more will follow. Some come from within (2 Cor. 7:5) - from our own weak flesh and faulty reasoning. Others are the messengers of Satan designed to tear down our confidence in the Lord. Doubts tend to run along the same lines both for us and our brothers in Christ, whether they come from our own hearts or from the whisper of the accuser of the brethren (Rev. 12:10). We doubt we will ever get married. We doubt that we could. We doubt the Lord's ability to make us fit spouses. We doubt the Lord's wisdom in keeping us single. We doubt His wisdom in telling us to marry. Our many sins and failures, our human weaknesses overwhelm us when we concentrate on them instead of the sufficiency of God. We don't feel spiritual enough to marry. We feel insecure and immature at times. Other times we may feel over confident, as if we were ready for marriage long ago and there is some mistake that we are still single. Thus we doubt God's will. Luke 12:29 And seek not ye what ye shall eat, or what ye shall drink, neither be ye of doubtful mind. Dear ones, if the Lord knows what we need to eat and drink - and He does - He surely knows what we need for our hearts! He knows what is good for our lives! We are commanded not to be of doubtful mind. Why? First, because the Lord knows that is our natural tendency and weak flesh. Secondly, because the Lord knows just what we need, and as with Peter walking on the water, He is there and told us to "Come." Matthew 14:31 And immediately Jesus stretched forth his hand, and caught him, and said unto him, O thou of little faith, wherefore didst thou doubt? 32 And when they were come into the ship, the wind ceased. When Peter started to sink and cried out in doubt, Jesus immediately caught him. His words may well be said to us too"...wherefore didst thou doubt?" Why indeed? We know He is the Son of God. We know He saved us from our sins (Eph. 2:5). How is it that we are so quick to doubt His love and power in this particular area of life? The Lord tells us later through Peter himself, that sometimes we need to be in heaviness. 1Peter 1:6 Wherein ye greatly rejoice, though now for a season, if need be, ye are in heaviness through manifold temptations: 7 That the trial of your faith, being much more precious than of gold that perisheth, though it be tried with fire, might be found unto praise and honour and glory at the appearing of Jesus Christ: Dear sisters, the trials and heaviness we have to go through in relation to being single are so that we might bring glory (and praise and honour) to Jesus Christ in that day when we stand before Him! James 1:2 My brethren, count it all joy when ye fall into divers temptations; 3 Knowing this, that the trying of your faith worketh patience. 4 But let patience have her perfect work, that ye may be perfect and entire, wanting nothing. The "whys" often come from our doubts, but even when they do not, they are still very real. Besides doubts, they too often cause confusion, and ...God is not the author of confusion, but of peace... 1 Corinthians 14:33 But, even when they are from a sincere heart, and desiring nothing more than answers and ...the knowledge of his will in all wisdom and spiritual understanding; (Col. 1:9), they seem almost to crush us at times. Why did You choose me to be single? Why must I remain so? Why do I feel so lonely even in the midst of my Christian friends and family? Why is there no visible possibility of marrying? Why do others have this, but I cannot? And so forth. Then there are the deeper, more painful "whys." Why didn't this courtship work out? Why was this engagement broken off? Why did he die? Why do I have a desire toward this worthy young man when he is so obviously interested in someone else (or purposed in his heart to remain single, as in one case I heard of)? These, and others like them, cut too deeply to even talk of at times. The "whys" for those who have been divorced are, no doubt, even more painful. There are many answers that could go here. There are many scriptures on trust and faith, on the Lord being our friend and portion, and on resting in the Lord that would answer these questions. But, we will again turn to Peter and how the Lord dealt with him. After the question and answer session on "lovest thou me more than these", we read the Lord's revelation of His will for Peter's end. Then we read in John 21:19 This spake he, signifying by what death he should glorify God. And when he had spoken this, he saith unto him, Follow me. 20 Then Peter, turning about, seeth the disciple whom Jesus loved following; which also leaned on his breast at supper, and said, Lord, which is he that betrayeth thee? 21 Peter seeing him saith to Jesus, Lord, and what shall this man do? 22 Jesus saith unto him, If I will that he tarry till I come, what is that to thee? follow thou me. Our Lord gave Peter the simplest command - "Follow me." Peter, being human like we are, wanted to know about someone else. He was quickly distracted by what someone else's place, blessings, or "calling" might be. He could not keep his mind on simply following Jesus. The people around him and what they might or might not get (that he might or might not be content about) was of more interest to him. When we feel ourselves crumbling under those dreadful "whys," beloved, may the words of our Lord Jesus to Peter remind us too of our real goals in life. "...what is that to thee? follow thou me." Psalm 139:1 O LORD, thou hast searched me, and known me. 2 Thou knowest my downsitting and mine uprising, thou understandest my thought afar off. 3 Thou compassest my path and my lying down, and art acquainted with all my ways. 4 For there is not a word in my tongue, but, lo, O LORD, thou knowest it altogether. 5 Thou hast beset me behind and before, and laid thine hand upon me. 6 Such knowledge is too wonderful for me; it is high, I cannot attain unto it. Even when we are so distraught and confused that we do not know what is right, what we need, or what we even want; when our thoughts are so uncertain that we don't know what to think - the Lord knows. He knows us far better than we know ourselves, and yet with such great love! 2Corinthians 4:17 For our light affliction, which is but for a moment, worketh for us a far more exceeding and eternal weight of glory; 18 While we look not at the things which are seen, but at the things which are not seen: for the things which are seen are temporal; but the things which are not seen are eternal. At times it is a sore affliction to be or remain single in this world of married people and families. It is a sore trial, but, beloved, it is not greater than what Christ suffered for us on Calvary. Our affliction is light compared to that! Oh so very light! Then too, we see that it is ...but for a moment... How very short this life is compared to eternity! Have you ever watched a shadow move? It very quickly passes through the day. So is this brief life on earth. Psalm 102:11 My days are like a shadow that declineth; and I am withered like grass. Psalm 144:4 Man is like to vanity: his days are as a shadow that passeth away. Even if it seems long to us now, when we get there it will seem like nothing, like just a moment. Ecclesiastes 6:12 For who knoweth what is good for man in this life, all the days of his vain life which he spendeth as a shadow? for who can tell a man what shall be after him under the sun? Only the Lord can tell us what is good for us in this life; and He, in His great wisdom, allows these light afflictions so that they will work for us a far more exceeding and eternal weight of glory. The affliction is light and for a moment, but the glory is weighty and eternal! Praise God! Eternal things. This is what we want. This what we must look at. Things not seen. Things that are given substance only by faith. (Heb. 11:1) How easily our thoughts run to things that are temporal and seen. We see what others have and their blessings in life, and we desire them for ourselves as well. But the things not seen, which are eternal, we have no way of seeing nor desiring except by faith. Hebrews 12:1 ï¿½ Wherefore seeing we also are compassed about with so great a cloud of witnesses, let us lay aside every weight, and the sin which doth so easily beset us, and let us run with patience the race that is set before us, 2 Looking unto Jesus the author and finisher of our faith; who for the joy that was set before him endured the cross, despising the shame, and is set down at the right hand of the throne of God. 3 For consider him that endured such contradiction of sinners against himself, lest ye be wearied and faint in your minds. 4 ï¿½ Ye have not yet resisted unto blood, striving against sin. Romans 5:1 Therefore being justified by faith, we have peace with God through our Lord Jesus Christ: 2 By whom also we have access by faith into this grace wherein we stand, and rejoice in hope of the glory of God. 3 And not only so, but we glory in tribulations also: knowing that tribulation worketh patience; 4 And patience, experience; and experience, hope: 5 And hope maketh not ashamed; because the love of God is shed abroad in our hearts by the Holy Ghost which is given unto us. This process of suffering and tribulations works in us so that we might have hope. For those of us that are single, hope can be a painful thing at times. We desire to be content and wait on the Lord, but the hope of a spouse and a family will so quickly spring up and take over our thinking. That hope easily leads to discontentment. Proverbs 13:12 Hope deferred maketh the heart sick: but when the desire cometh, it is a tree of life. How very much we need the hope that maketh not ashamed! Certainly few of us are utterly hopeless in the area of marriage. Most of us have a number of years before we arrive at that point (unless it is for some physical/mental reason or because of divorce). 1Corinthians 13:4 & 7, Charity...Beareth all things, believeth all things, hopeth all things, endureth all things. We also have a family friend who was not married till she was about 38 or 39. Her husband is 10 years younger than she is. They have served the Lord together very joyfully for many years. Fanny Crosby was around 11 years older than her husband. While this is a very rare occurrence it does occasionally happen. Both of these women had to wait quite some time to marry. Both served the Lord without distraction for quite a few years. If by chance, this were God's will, would it not be worth waiting for? And, why fret in the mean time? No, most of us are not hopeless in this sense. But, while we are not hopeless, our hope that we dwell in and on should not be the hope of marriage, but the Lord. Romans 15:13 Now the God of hope fill you with all joy and peace in believing, that ye may abound in hope, through the power of the Holy Ghost. We need this hope that fills with all joy and peace! We may obtain it from God through the power of the Holy Ghost and through the scriptures. Romans 15:4 For whatsoever things were written aforetime were written for our learning, that we through patience and comfort of the scriptures might have hope. It is by this very hope that we are saved. Romans 8:24 For we are saved by hope: but hope that is seen is not hope: for what a man seeth, why doth he yet hope for? 25 But if we hope for that we see not, then do we with patience wait for it. This hope gives us patience. In Samuel Johnson's Dictionary of the English Language the definition of hope is -"Expectation of some good, an expectation indulged with pleasure...Confidence in a future event or in the future conduct of any person..."
Beloved, if we would hope with confidence and without shame, then our hopes must be centered not on earthly, temporal blessings, but on heavenly, eternal things (Heb. 7:19). Our hope must be in God, 1 Peter 1:21. The good we expect must be spiritual good (Titus 1:2 & 3:7). The expectation we indulge with pleasure, that will not bring the shame of unfulfilled dreams, discontent and other troubles; is the earnest expectation and hope of Christ being magnified in our bodies. Philippians 1:20 According to my earnest expectation and my hope, that in nothing I shall be ashamed, but that with all boldness, as always, so now also Christ shall be magnified in my body, whether it be by life, or by death. The future events which we may have complete confidence in are Christ's coming for the church, His Kingdom, and the new heaven and new earth. Hoping for things we do not even know to be God's will for us leads to heartsickness, but these things we can hold with confidence, knowing Whom we have believed and received them from. 2Timothy 1:12 For the which cause I also suffer these things: nevertheless I am not ashamed: for I know whom I have believed, and am persuaded that he is able to keep that which I have committed unto him against that day. 1John 3:2 Beloved, now are we the sons of God, and it doth not yet appear what we shall be: but we know that, when he shall appear, we shall be like him; for we shall see him as he is. 3 And every man that hath this hope in him purifieth himself, even as he is pure. The hope of marriage and all it signifies, the hope that "he will be the right one," (or for our brothers that "she will..."), the hope that we will someday have our own children, the hope that we will somehow become "good enough" to marry, the hope that "this time it will work out" - all these and more like them, can and too often do lead us to sorrow, discontentment, covetousness, and lust. James 1:15 Then when lust hath conceived, it bringeth forth sin: and sin, when it is finished, bringeth forth death. But, the hope of being like Jesus and seeing Him as He is in all His glory, will cause us to purify ourselves because we will desire to be more like Him now. If we would only dwell on this glory in store; if we would only think what it will be like to look upon the face of our dear Redeemer (Job 19:25-26), what different lives we would live! Face to face - what will it be? God grant that we be "found unto praise and honour and glory at the appearing of Jesus Christ:" as we read in 1 Peter 1:7! "To have confidence in the future conduct of any person" we are told in the definition we read. I'm sure all of us have found out long ago how perilous it is to have confidence in man. For many of us, we have learned this in direct relation to the married/single issue. Psalm 118:8 It is better to trust in the LORD than to put confidence in man. It is better to trust the Lord, for with Him there is no disappointment of sin, human weakness, and no lack of tender love. Here is strong confidence. Proverbs 14:26 In the fear of the LORD is strong confidence: and his children shall have a place of refuge. Hard as it may seem at times, while hoping in Christ, we must also hope in other Christians, for He is in them (Col. 1:27) and working in them (Gal. 5:10, 2 Thess. 3:4, 2 Cor. 10:15). Paul repeatedly hoped in the saints - in their future conduct - based on their salvation and Who was working in them. Hebrews 6:18 That by two immutable things, in which it was impossible for God to lie, we might have a strong consolation, who have fled for refuge to lay hold upon the hope set before us: 19 Which hope we have as an anchor of the soul, both sure and stedfast, and which entereth into that within the veil; 20 Whither the forerunner is for us entered, even Jesus, made an high priest for ever after the order of Melchisedec. Our hope in the Lord is an anchor both sure and stedfast. How very much we need this anchor when the billows begin to roll. Like the strong anchor that keeps the ship from crashing into the shore and being destroyed or that preserves it from being driven before wild winds, so our hope within the veil will keep us if we will but trust it. To hope in temporal things - either marriage or any sort of earthly fulfillment - to hope in any other person, provides no strong anchor that will withstand the heavy seas of life. No sailor would ever set to sea without an anchor for his ship. It would be utter madness and mean certain destruction. That God used the picture of an anchor to speak of these things tells us how very important hope is, and that it be the right hope. I will gladly give my all, I've counted the cost. It is not something we may earn. We don't "deserve" it. We may need it to avoid sin (1Cor. 7:9 But if they cannot contain, let them marry: for it is better to marry than to burn. See verse 36 also.) It may be God's will for us (Heb. 13:4, 1 Tim. 5:9-14). We need to be mature enough for it in the sense of being of marriageable age and responsible both spiritually and in the things of life. But, there is not a measure for being "good enough" to get married. My parents also had two family friends that remained single their whole lives. (Of course, there were more, but these two brothers will be used here.) They both gave their whole lives to serve the Lord without distraction ministering to the saints and the lost. Both were men of honor. Both were faithful to the Lord. Both were used of God. If anyone "deserved" to get married, it was them. If marriage were a reward for faithfulness, these men would have gotten it. Instead, God glorified Himself in them by preserving them wholly to Himself to the end of their lives. Abraham lived a lonely life as an Old Testament believer. The other true people of God that we know he had contact with are very few. The only two we know he saw regularly were Sarah and one of his servants that appears to be a believer (Gen. 24). His nephew, Lot, had left him for the plains of Sodom, and he had no children of his own at this point. Yet, the Lord tells Abram (here) that He is enough. Abram had just refused the rewards of the wicked in chapter 14. He honored Melchizedek, priest of the most high God, and rejected the treasures of the wicked. God's reward to Abram was Himself, and we are told that he was called the Friend of God. James 2:23 And the scripture was fulfilled which saith, Abraham believed God, and it was imputed unto him for righteousness: and he was called the Friend of God. By faith in Jesus Christ, we also are the friends of God. John 15:15 Henceforth I call you not servants; for the servant knoweth not what his lord doeth: but I have called you friends; for all things that I have heard of my Father I have made known unto you. Our prize is in Christ Jesus. Philippians 3:14 I press toward the mark for the prize of the high calling of God in Christ Jesus. As single, we have the privilege of deeply knowing Him because we have more time to spend alone with Him. We have more time to sit at His feet if we will push away the cumbersome things. 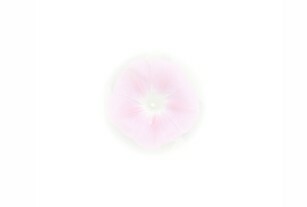 (Luke 10:40-42) We may serve Him without distraction. O what words I hear Him say! Happy place - so near, so precious! May it find me there each day! Luke 17:10 So likewise ye, when ye shall have done all those things which are commanded you, say, We are unprofitable servants: we have done that which was our duty to do. As "unprofitable servants", our duty is simply to be faithful. 1Corinthians 4:2 Moreover it is required in stewards, that a man be found faithful. We are not required to be found married, or with children, nor any other number of things. Faithfulness is what the Lord requires. Micah 6:8 gives us a fuller understanding of that faithfulness, and still we find no marriage, and so forth required. Micah 6:8 He hath shewed thee, O man, what is good; and what doth the LORD require of thee, but to do justly, and to love mercy, and to walk humbly with thy God? Marriage is a blessing, but singleness is a greater blessing because of the privilege to serve the Lord without distraction. 1Corinthians 7:38 So then he that giveth her in marriage doeth well; but he that giveth her not in marriage doeth better. But, for all, married or single, who will take the time to be the friend of God, our exceeding great reward is the Lord Himself. It is not marriage, nor singleness, but Himself. Who needs a better one? Our reward is to please Him. 2Timothy 2:4 No man that warreth entangleth himself with the affairs of this life; that he may please him who hath chosen him to be a soldier. There is also great reward for all who keep God's word. Psalm 19:11 Moreover by them is thy servant warned: and in keeping of them there is great reward. Philippians 3:14 I press toward the mark for the prize of the high calling of God in Christ Jesus. The prize we strive for is open to all, not just the married. Not one of us is excluded if we strive lawfully. 2Timothy 2:5 And if a man also strive for masteries, yet is he not crowned, except he strive lawfully. The question for us is, Will we accept this? By accepting and delighting in the Lord as our great reward, we may bring Him glory. His love will flow forth from our satisfied hearts to minister to others. We will be content and faithful. We will be free to be single to the glory of God, whether it be for us a time only, or for our whole lives. 2John 1:8 Look to yourselves, that we lose not those things which we have wrought, but that we receive a full reward. 9 Whosoever transgresseth, and abideth not in the doctrine of Christ, hath not God. He that abideth in the doctrine of Christ, he hath both the Father and the Son. In the Old Testament the Lord punished Israel for disobedience by not allowing the maidens to be given in marriage and by consuming their young men. (Psalm 78:63) The misapplication of Old Testament covenants and their accompanying curses to Church age saints can cause confusion in this and many areas. We are not under the Mosaic covenant, and marriage is not a reward nor a requirement in the New Testament era to show that we are blessed and right with God. As Philip's four, virgin daughters (who prophesied in the early church, but did not usurp the authority over a man) in Acts 21:8-11, we are free to glorify God as single. We should stand fast in this liberty that does not lower us to a second best or "rejected" place. John 8:32 And ye shall know the truth, and the truth shall make you free...35 And the servant abideth not in the house for ever: but the Son abideth ever. 36 If the Son therefore shall make you free, ye shall be free indeed. We are the friends of the Son, and He is our exceeding great reward. Surely this is true freedom! Single, married, mother, sister, child. Family, brethren, sinner, saints, reviled. Free to walk His path that's best for me. Free to know He knows what's best for me. In this freedom we are the servants of God, and as such, we must serve others more faithfully. Mark 9:35 ...If any man desire to be first, the same shall be last of all, and servant of all. We may labor in prayer for others more earnestly. We must be diligent to pass on the blessings God has given us. We should comfort others with the comfort with which He has comforted us. (2 Cor. 1:3-4) We must minister to the needs of the saints. We must not use this freedom as a cloak of maliciousness. 1Peter 2:16 As free, and not using your liberty for a cloke of maliciousness, but as the servants of God. It is not our place to try to convince others that singleness is a better way for all. We must not think more highly of ourselves than we ought. Romans 12:3 For I say, through the grace given unto me, to every man that is among you, not to think of himself more highly than he ought to think; but to think soberly, according as God hath dealt to every man the measure of faith. silent. O LORD my God, I will give thanks unto thee for ever. God will get the glory in our lives whether we yield to Him or resist Him, but it is for our profit to submit to Him willingly. 1Peter 5:5 Likewise, ye younger, submit yourselves unto the elder. Yea, all of you be subject one to another, and be clothed with humility: for God resisteth the proud, and giveth grace to the humble. 6 Humble yourselves therefore under the mighty hand of God, that he may exalt you in due time: 7 Casting all your care upon him; for he careth for you. 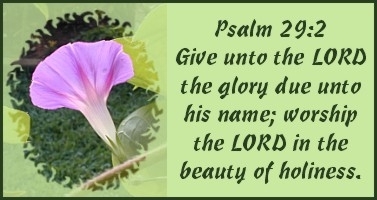 The Lord desires to receive the glory with our praise - not from silent or hesitant lips, but from willing, joyful ones. Hebrews 13:15 By him therefore let us offer the sacrifice of praise to God continually, that is, the fruit of our lips giving thanks to his name. Dear ones for Christ's sake, the happy ending is not that we will all someday marry or find fulfillment in some external source. The happy ending for each of us must be written in each heart yielding to God's will and joyfully, willingly allowing Him to glorify Himself through us.